Ever get tired of coming up with new blog post topics week in and week out? Then let’s go over how to painlessly generate more blog post topics. How Do I Generate Blog Post Topics Quickly? 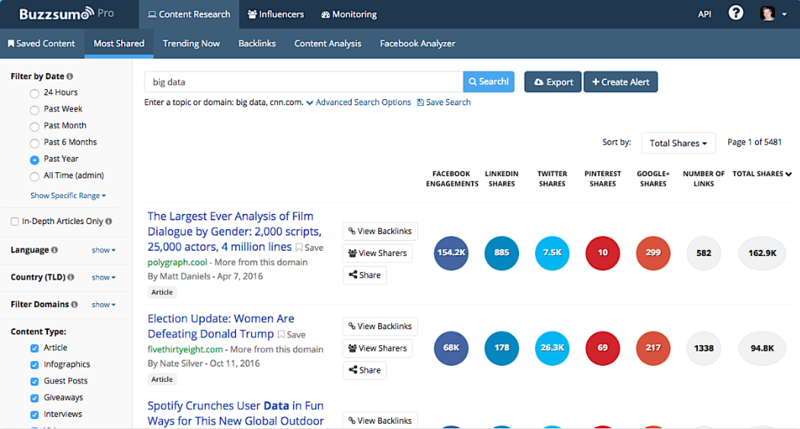 Far and away the best and fastest tool for generating more blog post topics is BuzzSumo. We’ve mentioned it many times. All you have to do is type in keywords within your industry and it’ll show you all the most popular stuff in real time. BuzzSumo tells you what’s hot and what’s not within your industry, and breaks it down based on social shares (Twitter, LinkedIn, Facebook, etc.). You can select which social sites matter to you. If you know that your audience is mostly on Facebook, you can just look at the Facebook data and see which headlines and blog post topic ideas are doing the best. Now, once Buzzsumo generates a list, you don’t want to just copy those exact blog post ideas and headlines and write something similar. You want to write something that’s better than the competition. 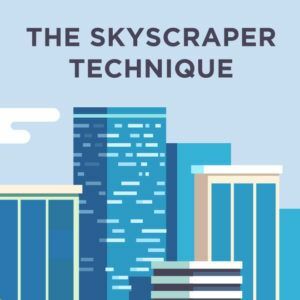 It’s a content marketing tactic Brian Dean calls the skyscraper technique. For example, if someone wrote an article that’s really popular in your industry called 10 Ways to Get Your Dog to Lose Weight, Brian would write an article titled 101 Creative Ways to Get Your Dog to Lose Weight. When you create something that epic that is so much more thorough and detailed, not only will it do well, but other people will be less likely to copy it because they don’t want to spend the time and effort coming up with 200+ ways for dogs to lose weight. Another tactic I really like is to look at posts that are fairly new. Let’s say somebody’s talking about a brand new topic in a popular piece. That piece will have all these great sub-headers that could use some more explaining. So I’ll create brand new, full-length pieces from those sub-headers. I like to go in depth. When you’re trying to come up with content topics or ideas, you need to look for what’s hot. The problem with blogging right now is that there’s already content on almost everything under the sun. So you don’t want to just write content that copies someone else. That’s why I love using Google Trends. You can type in keywords and see what’s hot within your space. 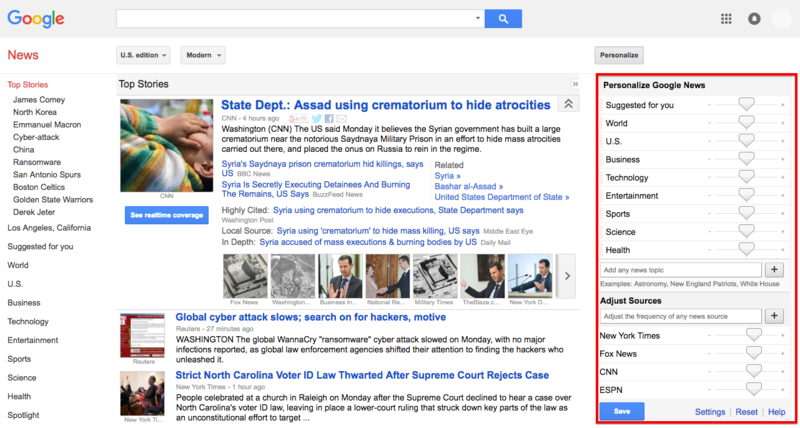 You can also do the same thing with Google News. That’s how you start crafting content that ranks. You’re not regurgitating old information. It’s not just about cranking out blog posts so you can hit a number, like “Oh, I want to publish two blog posts this week.” It’s about writing content that educates, provides value, helps people and is popular. That way, you’re tracking more people back to your site and converting them into leads or sales. Make use of the search feature on your website, too. You can hook in the search feature on your website with Google Analytics. (Just search for Google Analytics site search feature to find the instructions to do that.) From there, you’re able to take a look at what people are searching for on your website. If you see people searching for the same thing over and over, let’s say for a three-month period, that’s probably a good indicator that you should write something about it. Making use of the internal search feature is not something a lot of people talk about. Using tools like Hotjar or SurveyMonkey to survey people is also a reliable tactic. You have an audience already. People are reading your stuff and giving you feedback. Why not use that feedback to really harness the power of your audience? 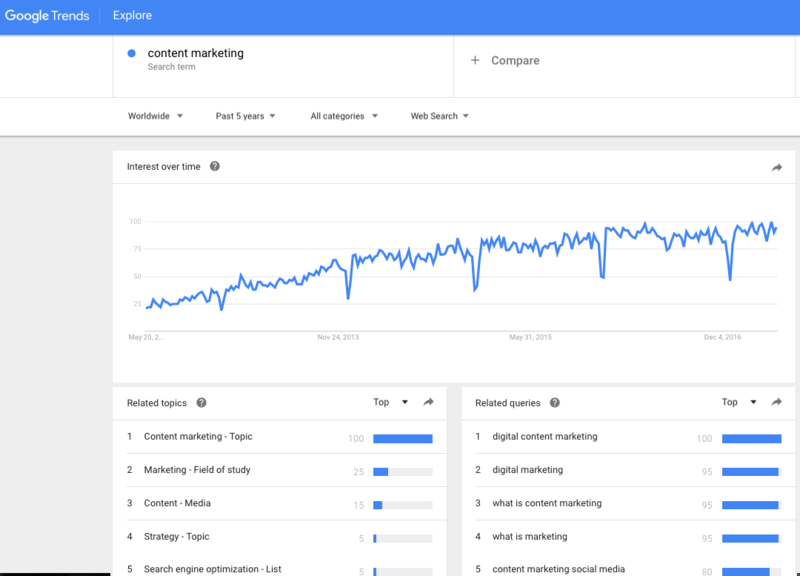 If you don’t have an audience that you can survey, but have competitors who’ve been at it for a while, just go to NeilPatel, type in your competitor’s URL into the SEO Analyzer and you’ll see a report. On that report, click on Content Marketing. It breaks down your competitor’s most popular topics and blog posts. You can do this for all your competitors. The beautiful part about this tactic is that Neil’s tool is free. Again, you shouldn’t be doing this just to copy your competition. You should be doing this as a rule of thumb to see what to blog about. My favorite aspect about Neil’s tool? I love sorting it by the content that’s least popular. When I look for trends with all my competition, I say, “All right, what is the least popular post that all my competitors have run?” Then I take notes. When I’m coming up with my own blog post ideas, I make sure to avoid anything that’s similar to the failures that my competitors have run. That way, I’m not wasting time writing blog posts that’ll be duds. I really like setting up content alerts (using Google Alerts). BuzzSumo has an alert feature, too. It shows when a competitor or site I really like has new articles coming out. For example, I have an alert for Copyblogger and Marketing Land. I see Marketing Land put out thirteen new articles per day, so they’re writing a lot. Copyblogger might have just one or two new articles per day. 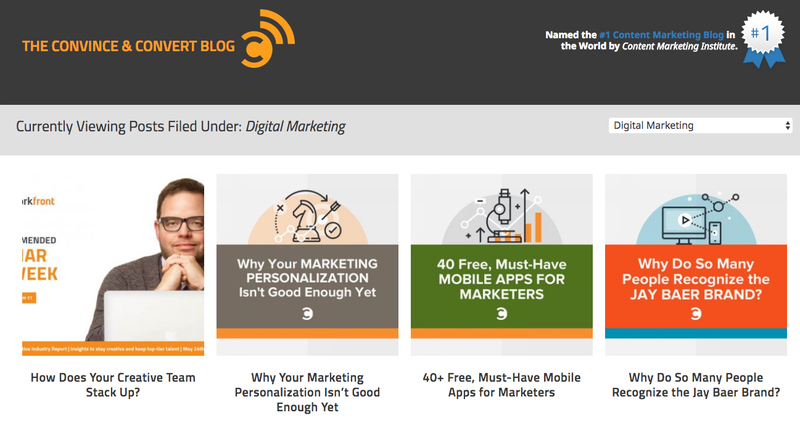 I also like following Convince & Convert, a content marketing blog. Long story short, setting up these alerts will let you see trends over time. You should always be looking at what elements of the top-trending pieces really resonate with you. What do you think will resonate with your audience? By doing that, you’re blending things together. You’re not exactly copying. It’s not enough to just synthesize better content using the best content out there, you also need to determine how well your new posts are doing using analytics. For example, Neil Patel created a post over a year ago called Online Marketing Made Simple: A Step-by-Step Guide. It did extremely well. But Neil didn’t know if it was going to do well; he just created that post because he liked the headline. The point I’m trying to make is that sometimes you won’t expect your hits to be hits. And sometimes the posts you expect to really take off go nowhere. That’s why you need to capitalize on what does well. For example, to follow up the Online Marketing Made Simple piece, Neil created a series. He wrote Digital Marketing Made Simple: A Step-by-Step Guide. Then he wrote Google AdWords Made Simple: A Step-by-Step Guide, Facebook Advertising Made Simple: A Step-by-Step Guide. You get the idea. 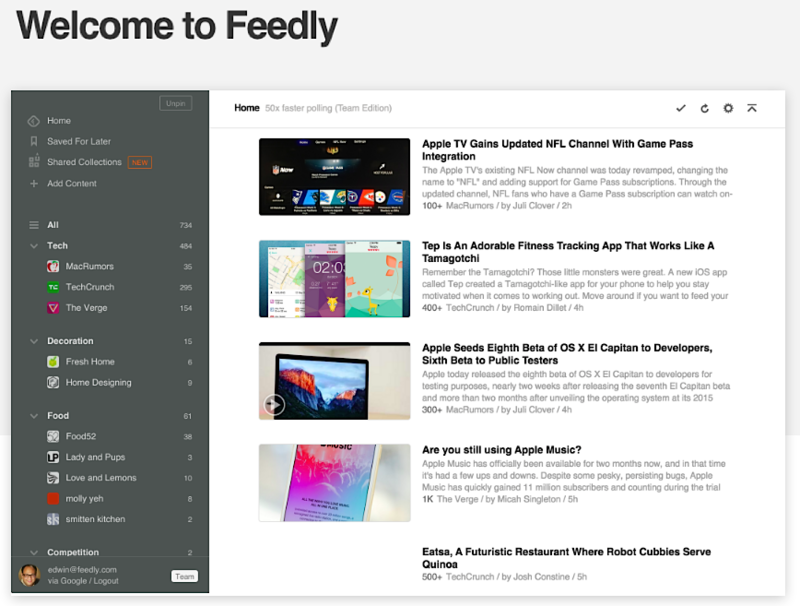 Finally, you can use tools like Nuzzel and Feedly. These two tools will help you save the articles that you want to read for later. Any articles that are good enough to make you stop and take action are worth saving for later. You want to have an inventory of headlines and topic ideas available to you. You want to strike while the iron’s hot. I like to pull out my Evernote, either on my phone or my laptop, and go to my notebook section. There, I’ll write down the ideas I have for different headlines, or I might email myself later just to make sure I’m not going to forget these headlines. Go to Quora and you’ll find a lot of questions within your field. You can see what’s popular based on votes. You can take the questions within your industry and write blog posts that answer those questions. After six months to a year, your response post will rank really high, and it will start bringing in more traffic for the long haul.